Drain-to-Source Breakdown Voltage (VGS=0V, ID=-250uA): -20V min. 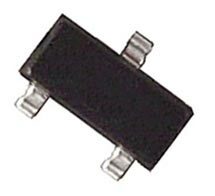 Static Drain-to-Source On-Resistance (VGS=-4.5V, ID=-0.61A): 0.60Ω max. Drain-to-Source Leakage Current (VDS=-16V, VGS=0V): -1.0uA max. Total Gate Charge (ID=-0.61A, VDS=-16V, VGS=-4.5V): 2.4nC typ. Rise Time (VDD=-10V, ID=-0.61A, RG=6.2Ω, RD=16Ω): 18ns typ. Input Capacitance (VGS=0V, VDS=-15V, f=1.0MHz): 97pF typ.